The holiday season is finally here, which means events will be popping up all over Washington. From the apartments for rent in Bellevue, the closest and most spectacular event is the annual Garden d’Lights at the Bellevue Botanical Garden. This stunning display is in its 24th year running, and is sure to amaze. Here’s everything you need to know if you plan on attending. 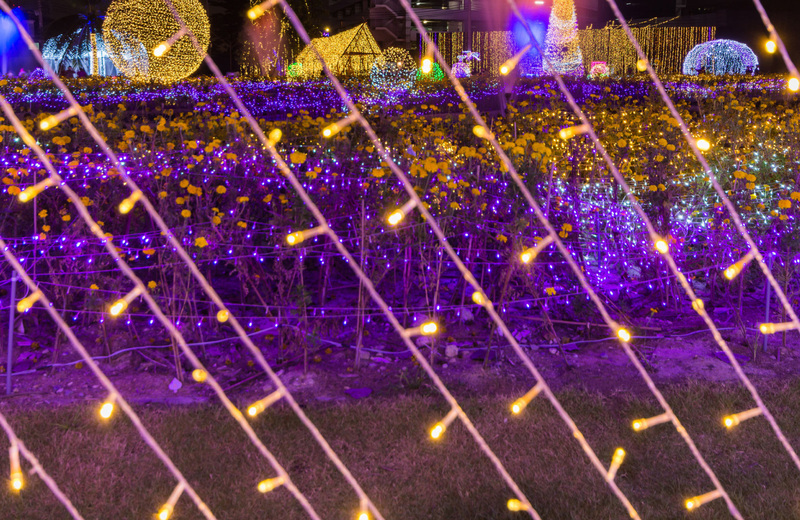 Garden d’Lights transforms the Bellevue Botanical Garden with over half a million sparkling lights. Each are formed into fantastical flowers, plants, animals and cascading waterfall sets as they weave into the natural beauty of the garden. If you’ve never seen this annual display of lights, then now is the perfect time. These decorations are wonder to behold, invoking the magic of the holiday season. The Botanical Garden will open its doors for Garden d’Lights from November 24th through December 30th this year, including Christmas Eve and Christmas Day. You can stop in anytime from 4:30 to 9 p.m., but you might want to stay for the duration to see the entirety of the display. As you weave your way in and around the illuminated installations, take the time to relax and examine the artistic work behind each one. During your visit, stop at the Aaron Education Center for refreshments and snacks. Coffee, tea, and hot chocolate are all on the menu. While you’re enjoying your snacks, check out the Gingerbread Village. This installation was created for Garden d’Lights by residents of Wilburton. Taking the traditional gingerbread house to the next level, this village features everything cookie people could possibly need to thrive in a small town. Musical entertainment will also be provided by various groups, all of which are family-friendly. There’s nothing quite like live music as you take in the light displays and warm up with some hot cocoa. Tickets are available both online and at the door. The ticket line is usually enormous, so it is highly recommended that you purchase yours online. You can buy yours via this link. The cost is $5 per person, with free admission for children ten and under. There are no night-specific tickets, so feel free to use on any of the event’s dates. There are also several free nights at the Botanical Garden. You can enter this event without a ticket from the 24th through the 29th of November this year. Staff will control the flow of the crowd so everyone can enjoy the show, which means there might be a wait to enter the building. Premium parking is available in the Botanical Garden’s lot for $5 a car, cash only. Anyone with a disability parking permit can park here for free. Slightly east of the Garden is Wilburton Hill Park on Main Street, which offers free parking for the event. Keep in mind that event parking is not permitted across Main Street. Nothing puts a damper on a good time like a ticket. If you have any questions, comments, or concerns, feel free to email the Botanical Garden staff at gardendlights@bellevuebotanical.org or by calling 425-452-2750. You can listen to pre-recorded information about the event by calling 425-452-6844. If you need any assistance purchasing your tickets online, call 888-959-6841 for live assistance via the Garden’s customer service line. You can also stay up to date on any changes through the organization’s Facebook or Instagram pages. Sleek, connected, and vibrant, Hyde Square ushers in a new generation of luxury apartments in Bellevue. Modern interiors feature clean, European styling with contemporary designs, while the community offers a plethora of amenities typically found in homes across the water. Your home at Hyde Square places you directly in the middle of what really matters in the Seattle area. An ideal location right off of SR 520 and Del-Red Road gives you immediate access to the Microsoft Campus, while RelayRides car sharing and various bus routes make commuting to work or traveling to play a breeze. Hyde Square acts as your central hub between the best of both worlds. Each home within Hyde Square comes fully equipped the finest in modern finishes. Solid-surface quartz countertops compliment modern, soft-close cabinetry. Tiled full-height backsplash accentuate stainless steel appliances, while wood flooring leads to spacious windows that allow for ample amounts of natural lighting. Full size, front-loading, stacked washers and dryers eliminate the tedium of community laundry, allowing you to enjoy breathtaking views from your private deck or balcony. A selection of carefully curated, on-site amenities cater to every aspect of your lifestyle. Stay active in the state-of-the-art fitness center as well as a spin and yoga studio. Relax after a long day in the tavern-style bar room, expansive private spa deck, or wellness center with indoor sauna. Start your day off right in the coffee lounge, socialize with friends by the barbeque and fire pit areas, or sit back and enjoy life in one of two sky lounges with rooftop access. A pet spa and grooming area caters to furry residents, while finer touches like concierge service and convenient package management handle the little details in life. Everything you need is right outside your front door. We invite you to experience the new urban age in Bellevue, Washington, where luxury, style, and design come together to create an elevated sense of living. Welcome to a redefined sense of apartment living. Welcome to Hyde Square.